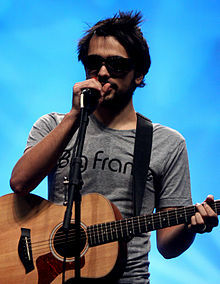 Jônatas de Moura "Joe" Penna (born May 29, 1987) is a Brazilian musician and filmmaker. He currently resides in Los Angeles, California. Penna maintains the YouTube channel MysteryGuitarMan. He registered the MysteryGuitarMan channel on June 16, 2006. By January 2011, MysteryGuitarMan became the most subscribed channel in Brazil. As of January 2019[update], his channel has garnered over 2.7 million subscribers, and his videos have accrued nearly 400 million views. On September 11, 2005, Penna launched a second YouTube channel, where he uploads his making-of videos and vlogs. Within 6 hours, it became the third most subscribed channel in Brazil. In 2007, Penna was one of the first YouTube channels to receive mainstream media coverage, including attention from DC Fox News, after his "The Puzzle" video was featured on the front page of YouTube. In 2009, Penna was again seen on the front page of YouTube with his "Guitar: Impossible" video, which has been covered by De Wereld Draait Door, the highest-rated primetime show in the Netherlands. On December 6, 2009, Penna was featured on FM4, an Austrian national radio station. Shortly after uploaded, his "Guitar: Impossible" video was featured on the MSN.com front page. Best Buy announced Penna as the $15,000 winner of their Tech-U-Out Video Challenge. He was also a finalist in the "Oreo Global Moments" video competition. Ford selected Penna as a Fiesta Agent for the 2009 Ford Fiesta Movement. Penna's "Guitar: Impossible" video was also featured by YouTube as one of the best videos of 2009. In 2010, Penna's "Root Beer Mozart" was featured on CNN's morning show Morning Express with Robin Meade and on Germany's nationally broadcast Taff show. In 2009, Penna directed an ad in collaboration with Rhett and Link entitled "T-Shirt War". It quickly garnered international attention. Shortly after, Penna was selected as one of the top 10 new directors at the 20th Cannes Lions Saatchi & Saatchi New Directors' Showcase. Following the success of the original, Penna and the original cast were hired to produce a national television and cinema spot for Coca-Cola and McDonald's. A year later, Penna directed and starred in yet another commercial for the two companies. In June 2010, Penna was highlighted by CNN Money on their Best Jobs series. His stop-motion short film "Guitar: Impossible" was selected to be displayed at the Guggenheim museum. In 2012, Penna co-wrote and directed an original interactive thriller series entitled Meridian, starring Orlando Jones and Rick Overton in conjunction with Fourth Wall Studios. In August 2014, Penna was announced as the host of Xploration Earth 2050, a technology-oriented television series. Xploration Station went on to receive eight Daytime Emmy Award nominations. In March 2016, his short film Turning Point was selected to play at the Tribeca Film Festival. In February 2017, Penna began production of his directorial debut feature film, Arctic. It was shot in Iceland and stars Mads Mikkelsen. Arctic garnered enthusiastic reviews as an Official Selection for the 2018 Cannes Film Festival. Its theatrical premiere is set for February 1. ^ a b "Fantástico: Brasileiro larga a medicina e ganha dinheiro fazendo vídeos no YouTube". Retrieved 2010-02-20. ^ Penna, Joe (August 25, 2011). "Love Story". YouTube. Retrieved September 11, 2011. ^ "Joe Penna / MysteryGuitarMan – about page". MysteryGuitarMan. YouTube. Retrieved 23 January 2019. ^ "Most Subscribed of All Time - Brazil". Retrieved 2010-02-12. ^ "MysteryGuitarMan". YouTube. Retrieved September 1, 2014. ^ "Fox 5". Retrieved 2009-03-31. ^ "De Wereld Draait Door - 31 maart 2009". Retrieved 2009-03-31. ^ "Ford Fiesta Movement". Retrieved 2009-03-31. ^ McGlynn, Katla (2010-02-09). "Amazing Stop Motion T-Shirt War (VIDEO)". Huffington Post. Retrieved 2010-04-30. ^ "Saatchi & Saatchi New Directors Showcase Bows in Cannes - Extreme Reach". SourceCreative - Extreme Reach. Retrieved 2018-04-12. ^ "T-Shirt War 2". Retrieved 2010-06-26. ^ "CNN Money". Retrieved 2010-06-26. ^ "YouTube and Guggenheim showcase video artists". Retrieved 2010-09-30. ^ "CNN - YouTube search for most creative videos". Retrieved 2010-09-30. ^ "MysteryGuitarMan Joe Penna Brings Interactive Thriller To Rides.tv". Retrieved 2013-01-04. ^ "MysteryGuitarMan is the latest YouTube star to get his own TV show". The Daily Dot. Retrieved 13 August 2014. ^ ""Xploration Station" Earns Eight Daytime Emmy Nominations". ^ N'Duka, Amanda (2017-04-19). "Mads Mikkelsen To Star In Thriller 'Arctic' From Armory Films". Deadline. Retrieved 2018-04-12. ^ "Mads Mikkelsen on Surviving the Polar Wilderness in 'Arctic'". 2017-04-21. Retrieved 2018-03-15. ^ Tartaglione, Nancy (2018-04-12). "Cannes Film Festival 2018: Spike Lee, Jean-Luc Godard, Jafar Panahi In Competition; Whither Von Trier? – Full List". Deadline. Retrieved 2018-04-12.